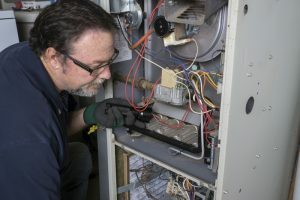 Furnace Maintenance Isn't Just Another Chore | Clean Air Act Inc. Your furnace is a machine, and every part was made for a particular purpose. Likewise, there’s no part that isn’t necessary. When one of these pieces fails, it might not always stop the system dead in its tracks. However, it will end up taking some toll on the system, and that can create a chain reaction. Carbon Monoxide Leaks: Carbon monoxide is a colorless, odorless gas—and it’s deadly. When furnaces aren’t maintained, one of the risks that’s created is that of the carbon monoxide leak. Something as simple as a clogged air filter or damaged flue pipe can create a leak. For older systems, it’s not uncommon for their heat exchangers to crack, which can produce the same undesired result. (Having a carbon monoxide detector installed is essential when dealing with gas furnaces!). Efficiency Will Drag: When one part of your furnace stops working, it will cause other parts in the system to start working harder. And that usually means your furnace will need to work longer and harder to bring your home to the temperature you’ve set on the thermostat. If your heating bills are suddenly increasing, it’s usually an indicator that a repair issue is causing your efficiency to tank. More Repairs: Broken parts lead to other broken parts. It’s estimated that nearly 85% of problems can be prevented with regular maintenance. The maintenance check just before the season could be the one that prevents a costly breakdown. Shorter Lifespan: A system that is inefficient and constantly being repaired is suffering from excessive wear-and-tear. Heaters are expected to last from 10 to 15 years, and some have been known to last even longer. The bottom range of that figure comes from those furnaces that have suffered more than the usual number of repairs during its life. Most of all, neglecting maintenance is like wasting money. When you paid for your furnace, you paid for a unit that is supposed to perform at a particular standard of efficiency. However, that standard is based on the furnace running at its top performance, and no less. Since maintenance directly correlates with efficiency, neglecting maintenance is the same as putting a limit on your furnace’s potential. You paid good money for that efficiency promise, so don’t waste it! Setting up maintenance for your furnace is easy. Contact The Clean Air Act today and we’ll schedule everything for you.